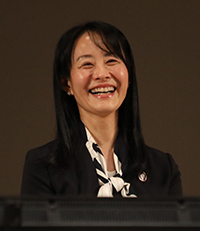 Dr. Izumi Yoshizaki, the project manager of the JAXA Protein Crystal Growth project (JAXA PCG), joined the Kibo-ABC regular monthly web conference on September 27th to give a special lecture on the PCG experiment. The goal of the JAXA PCG project is to "contribute to society by determining the precise protein structure from high quality crystals obtained onboard ISS". New findings in biology/biochemistry by academic users. 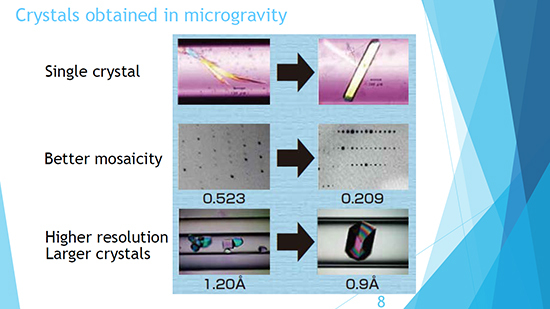 Microgravity suppresses solution flow (convection) and allows protein crystals to grow in a stable environment with less impurities delivered to the crystal surfaces. This is why we often obtain better crystals in space (see Figure 1). "Counter Diffusion method" shown in Figure 2 is used for PCG experiment. One end of a glass capillary containing a protein solution is sealed with clay and a silicon tube filled with agarose gel is attached to the other end. The gel side is immersed in a crystallization solution in a sealed container. As both the crystallization and the protein solutions diffuse through the agarose gel, concentration gradient is gradually formed in the capillary. The gradient changes over time. Within one to two months of the incubation period, concentration gradient is gradually formed in the capillary. The gradient changes over time. Within one to two months of the incubation period, crystals are grown at the appropriate concentration area in the capillary. Currently, four or five space experiments per year are available. An experiment temperature of 20 degree C or 4 degree C can be selected. The crystals obtained in Kibo are subjected to X-ray analysis after sample return from the ISS. Q. Have you presented these works at international medical/biotech conferences? No, not in those conferences. I presented something similar at the ISS R&D conference 2018. Q. How long does it take for ground preparation before launch (sample check etc.)? The time for ground preparation is usually half a year if the samples are well prepared, and the crystallization conditions are well established. Q. If we already know the crystallization conditions, will it take less time? 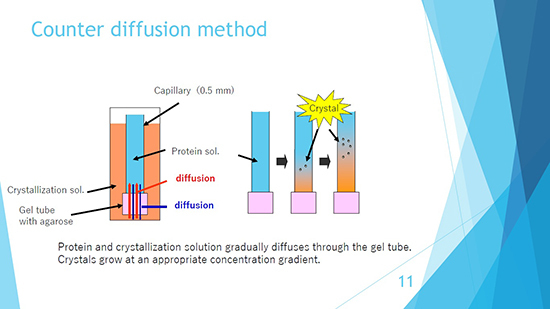 We still need to modify the crystallization condition for counter diffusion method which takes about 1 month. Moreover, we have to go over the paperwork including the safety review, which takes four months before launch.